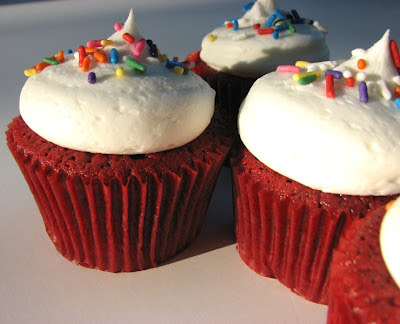 I have never had a Sprinkles cupcake but I hear they are fantastic - especially the red velvet ones. Jaclyn from Cooking Classy blog came up with this copycat recipe. I was not specifically looking to make red velvet cupcakes but just came across this recipe while browsing different baking blogs. Sometimes recipes just jump out at me for no particular reason. I was bored, I wanted to bake, I had all the ingredients, it looked like a yummy recipe and it received good reviews. Ok! I was in! 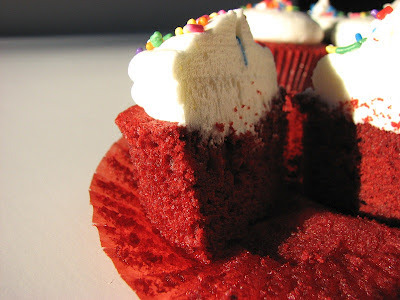 I did like this recipe alot but I have a couple of other red velvet cake recipes that I like just as well. I kind of prefer the ones that have oil in them (in addition to butter) because it gives the cake a moistness not matched by butter only cakes. The only change I made in this recipe was I sifted my dry ingredients together. 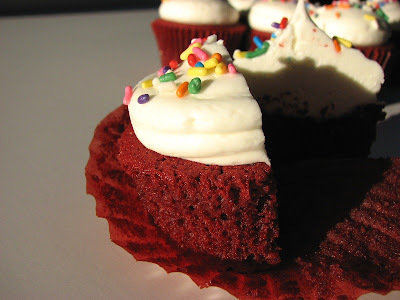 Oh, and Jaclyn mention putting the cooling cupcakes in an airtight container to continuing cooling to presevese moisture - I also didn't do that part - mostly because I didn't even notice that hint till just now as I was posting this! This cake was super soft & delicate. Not dense at all. 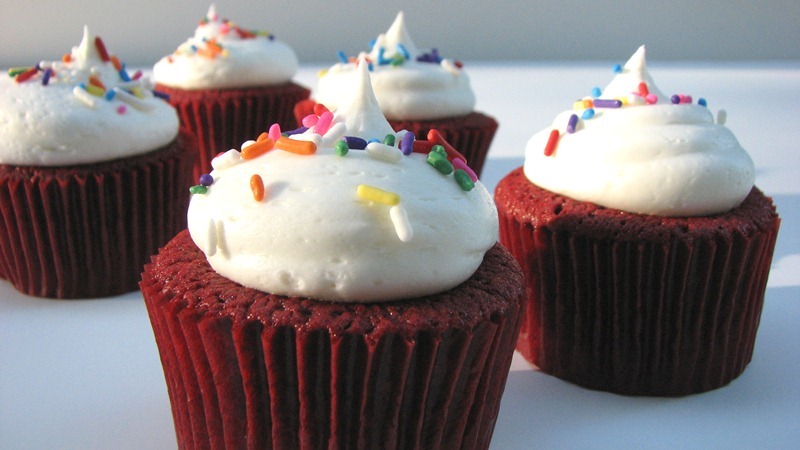 Very subtle chocolate flavor which is what a red velvet cake should be. My cupcakes did have a slight dome when they were first removed from the oven but they flattened as they cooled. The photos show cupcakes that were in NON greaseproof liners. I also baked some in greaseproof liners - really pretty decorative liners. I don't know about you, but I do NOT have good luck with greasproof liners. All of the cupcakes that were in greaseproof liners pulled away from the liners almost entirely. They looked horrible with little part of the cupcakes still attached to the liner and the ripped up cupcake sitting in the middle. I do not know how to prevent that but it makes me not want to use them. Does anyone have suggestions? I've tried filling them a bit fuller so the extra batter would seal the edges but it didn't work. But anyway, back to the cupcakes! This recipe is very simple to throw together and that's always nice. Make sure you use the vinegar when making a red velvet cake. It's an important ingredient in the texture of the cake. I know it's a very small amount but it's crucial for the texture. Everyone is always so in awe of the beautiful color of this cake. It IS very striking and makes a gorgeous presentation. I really don't know anybody that doesn't like red velvet cake! Preheat oven to 350 degrees. In a mixing bowl, whisk together flour, cocoa powder and baking soda, set aside. In a separate large mixing bowl, using an electric mixer, whip together butter and sugar until pale and fluffy, about 3-4 minutes. Add in eggs one at a time stirring after each addition. (Now stand back and change out of any nice shirt you have on and) Add red food coloring and vanilla extract and mix until combine. In a small mixing bowl (or in the measuring cup you used to measure milk), combine milk and 1 tsp vinegar. Add milk mixture and flour mixture to cupcake mixture, alternating in two separate batches, mixing until combine after each addition. Divide batter evenly among 12 paper lined muffin cups, filling each cup about 2/3 full. Bake in preheated oven 20-23 minutes until toothpick inserted into center of cupcake comes out clean. Remove from oven and allow to cool about 2 minutes in muffin tin, then transfer to wire rack to cool for 10 minutes, then transfer to an airtight container to cool completely (this just helps them retain more moisture). Check out my blog as well. Btw do you think blogger is better than wordpress?